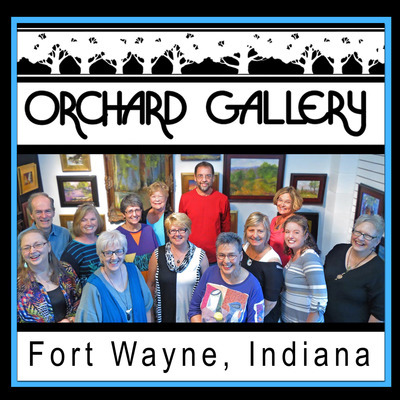 Our customers say that "The Orchard Gallery of Fine Art is the best kept secret in Fort Wayne." The Orchard Gallery is owned, managed and staffed by local artists. Throughout the year, a portion of the gallery is dedicated to month-long featured exhibits highlighting individual work of both members and other artists from around the region.. Non-member artists are invited to participate in specialty exhibits. The Orchard Gallery offers a wide range of fine art to meet your home decor, office and gift-giving needs. Clay. Glass. Jewelry. Paintings (oil, watercolor, acrylic, pastel & mixed media). Photography. Fine Wood Working. Sculpture. Fabric Art (clothing, dolls, handbags). Prices are reasonable. And admission is FREE. Hours are 10:00 AM - 5:00 PM Monday through Saturday with extended hours to 7:00 PM on Tuesday and Thursday. About this site...we are showing examples of our work. In some cases, what you see may be sold. If you see something you like, contact us and we will let you know the status of the piece. Please note that due to differences in monitor settings, images may not appear as vibrant as the original.